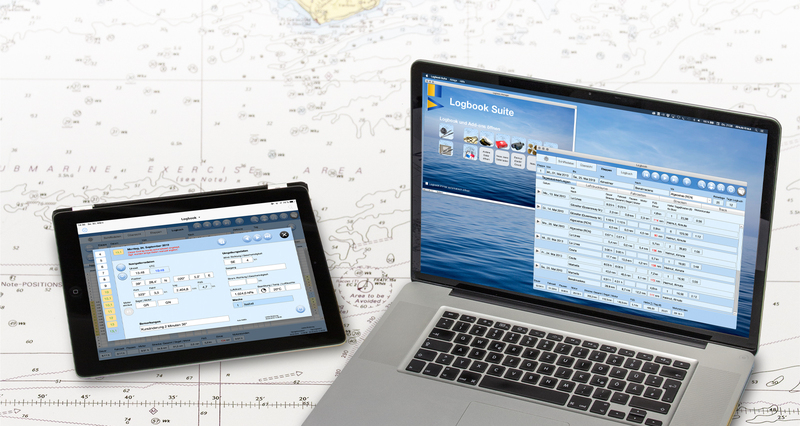 Logbook Suite is a user-friendly logbook software package from yachtsmen for yachtsmen (both sailors and motorboaters)—Made in Germany. Logbook Suite includes the digital logbook Logbook more here) and Add-ons (more here)—useful tools, which help to manage tasks around your ship and your travels on yachts. The Logbook software replaces the handwritten logbook on sailing and motor yachts. Yacht owners and skippers from charter yachts from over 40 different flag states are using Logbook Suite on all oceans and on numerous inland waterways. The software is in the market since more than 8 years now and is continuously updated and further developed. All updates are free (the current version of the logbook is 4.0). With the software package Logbook Suite we provide the only digital logbook for Mac users. But Logbook Suite is very popular with Windows users too, because the user interface differs from other digital logbooks and it is orientated by the traditional, hand-written logbook. Instead of computer-technical input masks the software provides pages with a practice-oriented layout which make it really easy to enter all relevant data into the logbook. Logbook Suite works completely without internet access. If you use Logbook on an iPad Cellular, 4G or 3G the current position can be read from the iPad's GPS and used for your logbook entries. And if you connect a NMEA onboard network or a GPS receiver to your iPad or PC, Logbook can read the nautical data and enter it automatically into the logbook. The software package Logbook Suite is available for Mac, Windows and iPad. The versions for Mac and Windows (Mac with MacOS 10.11, 64 bit, or newer, Windows with Windows 7, 32 bit or 64 bit, or newer) can directly be downloaded from our website. Logbook Suite for iPad is available in the Apple App Store. Please click the links on the right side of this page to download the versions for free. You can use Logbook Suite either on iPad or on PC (MacOS or Windows) or alternately on iPad and on PC in parallel. The data can easily be exchanged between PC and iPad using iTunes or a cloud service. The user interface is the same on all platforms. Logbook Suite can be set up to an English, German, Dutch or Swedish user interface. All user manuals are available in English and German. Convince yourself of Logbook Suite with our free trial version. The trial version offers all features of the full version, but Logbook is limited to 5 travel days and 2 trips and the Add-ons to 5 entries. The buttons in the right column of this page lead to the download form for Logbook Suite for your operating system or to the free download of the iPad version from the Apple App Store. On our download page you can also download detailed manuals. If we could convince you of Logbook Suite, you can purchase the appropriate licenses in our online shop and convert your trial version for PC or iPad directly into a full version and unlock it for unlimited use.